It’s spring time, the lawn finally gets mowed again, closets get cleaned out, the garage gets an overhaul, and the kitchen gets reorganized. The dust is flying and when it settles we have the hardest time keeping it off of our newly cleaned house. It also happens to be the season when all those beautiful flowers bloom and many of us suffer from allergies. We can help eliminate odors, dust, allergens, bacteria, and germs from your home while saving you the hassle and extra cost. Sit back, relax, and enjoy a cleaning cocktail on us that you will appreciate year round. We have our top shelf maintenance that makes sure your system operates smooth and crisp. Second, we are offering professional duct cleaning to give you the most pure and fresh air, making each breath more enjoyable. Finally, we are offering The Protector. This space age technology is derived from the purification systems on the international space station and uses ionization and infrared light to attract and eliminate odor particulates, germs, microbes, and allergens from the air and from surfaces in your home. 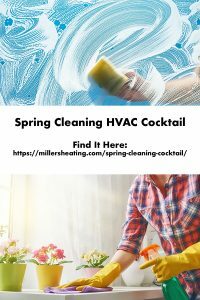 Breathe delicious air again with a spring cleaning and reward yourself with a little cocktail while you are at it. Fresh, pure, clean air is a trademark of a clean home, as an added pinch of sugar in your cocktail we will add a free filter if you pick two or more services mentioned above. And if you really want to treat your self get all three spring cleaning cocktail options scheduled a tune-up on your system, purchase a filter, and upgrade to a WiFi thermostat. At the Miller’s office location, we offer a range of filters including standard size filters, custom filters and lennox heat pump filters. Sweeten up your spring and freshen up your house.